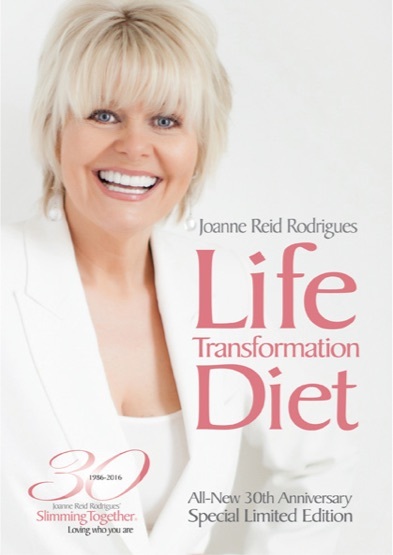 Joanne’s Bestselling Life Transformation Diet is the foundation for all Slimming Together healthful weight loss plans, carefully constructive to guide you on a new way of life. At Slimming Together, we teach a way of life. Sustained success only happens with a change of lifestyle. Joanne’s method offers health-oriented, low glycaemic meals to help prevent disease and naturally raise mood, energy, and vitality as well as the desired weigh loss. As a qualified nutritional therapist, Joanne has ensured her eating plans will help reduce inflammation in the body, which in turn reduces diet-related disease and illness, and pain and stiffness. If you want to lose weight while eating lots of processed diet foods or junk foods, this programme is not for you. But if you’re ready to have a healthier relationship with food, you’ll love our programme. Food is a pleasure, but much more; food is our nourishment. We care about your health and we care about your family’s health. That’s why our weight-loss plan comprises of healthful wholefoods. We offer a no-gimmick, no-nonsense, healthful eating plan that will help you lose weight and increase your feel-good factor. The beauty of Slimming Together’s weight loss plans is in their sheer simplicity – we give you a simple system to help you look and feel your best, and results will start when you do! Joanne’s dietary programmes for Slimming Together are suitable for non-vegetarians, vegetarians and vegans, and people with gluten or wheat intolerance, dairy intolerance, or any food sensitivity or intolerance. Joanne also teaches dietary intervention for all aspects of health and is able to guide clients on health issues including overcoming low mood, optimum thyroid function, balancing the endocrine system, alleviating PMS and symptoms at perimenopause and menopause, arthritis and gout, diabetes prevention and management, IBS and inflammatory bowel disease and other digestive problems and chronic fatigue. Joanne can also advise on your nutritional needs before, during, and after pregnancy.